In the process of trying to find a Publisher, one of the questions they asked was “Are there any similar books out there?” To the best of my knowledge – not many! There are lots of historical and social history books – and believe me, I have read many of them over the past nine years – but none that I could find that looked at the roots, the foundations of the British Colonies and ultimately the United States of America from a Christian perspective. Certainly, none that I could find that asked the question – “Because of the negative interactions between the colonist and the Native American Nations during the 17th and 18th centuries, what footholds did Satan establish?” The answer to that question is key to the deep root healing of your nation. I do not believe that I have any spiritual authority to speak into contemporary American issues, but I can stand in the gap, on behalf of my ancestors and repent of the legal, political and theological foundations/strongholds of Satan which we established through such means as the Doctrine of Discovery – so often in God’s name. Interestingly, the research for this book has also been most illuminating for me regarding the ongoing relationship between the UK and Ireland – including the Brexit debate over the Irish border! Following the Reformation, Ireland’s relationship with England was to change further, with devastating consequences for the Catholic Irish people. That coincided with England’s first colonial exploration of North America and our contact with the Native peoples. Some historians have commented that Ireland was England’s training ground for dealing with the savage other: Irish and Indian! Forced land removal, genocide… We continue to live out of that at a profoundly deep level, on both sides of the Atlantic. Our histories are intricately linked! 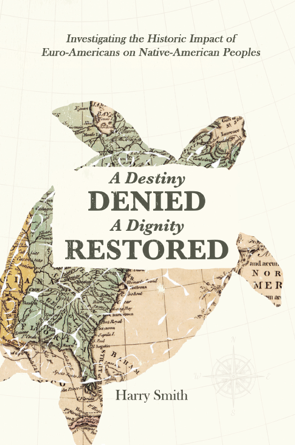 Purchase A Destiny Denied... A Dignity Restored. £8.50 / Euro 10.00 / $20.00 P&P incl. Yet through it all, I see a real hope of the river of God’s Spirit flowing throughout the whole of Ireland – through the Church, culture and society – in healing power. This is a radical call to intercession for all Christians with a heart to pray for Ireland and specifically to the current spiritual leadership of the Protestant Churches, to remove what I believe through my research, to be a foothold of Satan produced by a covenant that our forefathers entered into in 1912 – The Ulster Covenant. This is all the more significant when we realize that the 100th anniversary of that Covenant is drawing near. You can only purchase this book directly through me! Please contact us if you would like to purchase any of the above. We accept payment via paypal.